Would you like to sew and sell items made from this pattern? Commercial licenses are available! Another quiet book page is ready for Jax’s book! When I was doing the laundry this week, I managed to pull 6 of Jax’s tiny socks out of the dryer before I found one with a match. That inspired this page! This page has a dryer with a clear door closed with a snap. Inside there are 6 socks without their other halves. The opposite page has the remaining socks. You match them together and the stick with magnets. 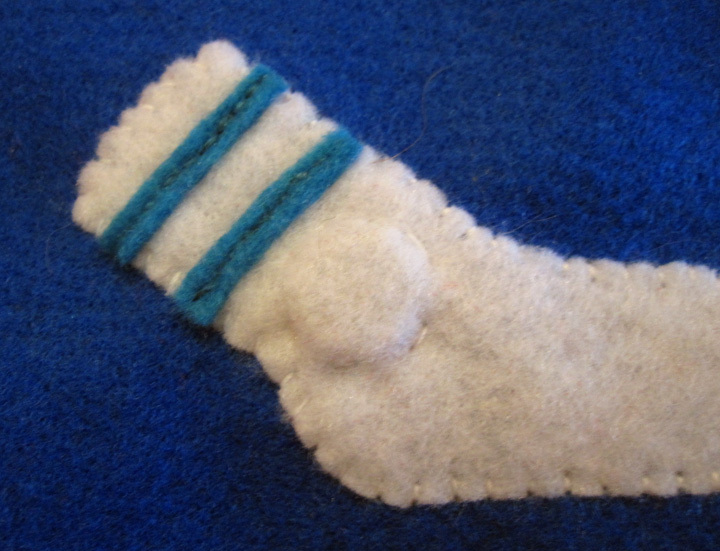 My materials were: two 9″ blue felt squares, felt (in light blue, gray and charcoal for the dryer, then assorted scraps for the socks), clear vinyl, a snap, 2 buttons and 12 magnets. I had to use 2 different sizes as I didn’t have enough small ones. I put those in the loose socks and the heavier ones on the page. Either size worked fine. You can find them in the craft store. 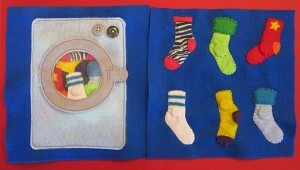 I started by laying the dryer back and front together on the page and machine stitching around the outside. I pieced the door together by layering the clear vinyl between the two door rings. I also stuck the double-layer door hinge in the left side. I sewed twice around the ring. I placed the door in position and tucked the hinge into the pocket (trim it if it doesn’t fit with the door in the right place.) I hand-sewed the hinge down through all the layers of the page. Using 5 strands of embroidery floss, I whip stitched around the hole of the dryer to fortify it a bit. The latch got a snap on one piece, then I sewed it by hand to the right side of the door. I lined the other half of the snap under it and stitched it on. I added buttons to look like the controls on the dryer. I had fun with the socks. You need to cut three of everything for each sock design: one layer for the sock appliquéd to the page and to sides for the loose socks. My pattern includes pieces to make a cuff and colored toes and heels. I also included a little star. My favorite socks are the white and aqua tube socks and the zebra print with hot pink accents! When you sew them together, place a magnet inside and stick a ring around it so it doesn’t shift. For more free quiet book patterns, go here! If you use this pattern, please add a comment or link to me. I really would love to see your version! Go crazy with the socks! This entry was posted in Crafts, Quiet Book, Sewing and tagged Free, Patterns, Quiet Book, Sewing on September 22, 2011 by Stephanie. I have 11 grandkids and am in the process of making 8 of them quiet books. I know… Crazy! I LOVE this page! Where did you find zevra felt! Or did you use cotton! Wow, 8 quiet books! You are a super grandma! I’m wondering if anyone would like to join me in a “quiet book club” where we each make a certain number of the same page and then share the ones we’ve made with each other. I have 19 grand kids and am currently working on 6 quiet books at a time (all the same) Email me if anyone is interested. Hi Jane, If you you have Facebook, our Facebook page would be a great place to ask others to join a quietbook swap! Thank you for this inspiring blog. I love your quiet book pages and the helpful links. I started making the sock matching page and I’m using some silver duct tape from Michael’s, laminating paper sealed together for the clear opening, and more duct tape to connect the door and create a hinge. 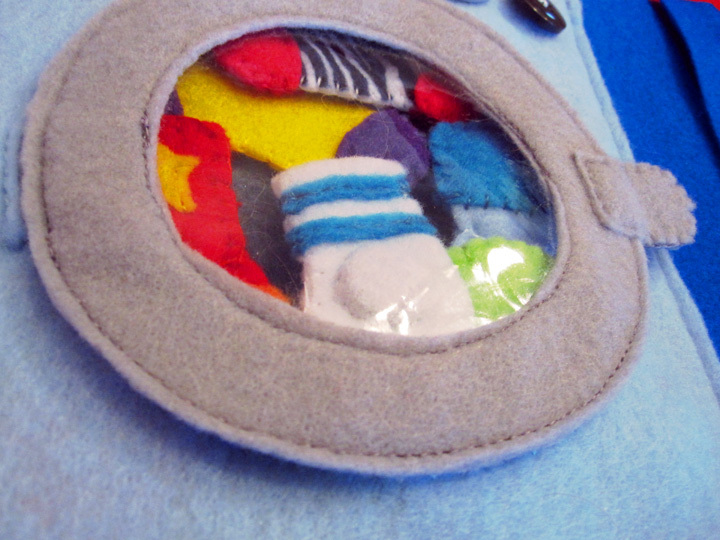 I’m then using sticky velcro to close the door and thus making the pouch out of felt for the actual dryer. I can’t wait to do an oven, cupcakes, and some other fun stuff. I am binding it with cupcake fabric and those rings (whatever they’re called) that allow me to add and remove pages. I can’t wait to see it all finished!!! Sounds creative and wonderful! I’d love to see photos when you are all done. I’m not able to make quiet books to sell right now, but it’s something I’d love to do in the future. But right now, I have to work my day job. A flight to LA was my reason for starting the qb! I took his favorite pages on board and they were a big hit – especially for takeoff and landing when the iPad was off. Then he was able to play with them on the trip since he didn’t have many toys along. Your quiet book pages are amazing! You are so talented! These are honestly the best ideas and best quality of pages that I have seen on the web. I especially love the train and socks. Thanks for sharing them. I can’t wait to make them for my almost 2 year old! I just want to say thank you so much for your willingness to share your patterns! I will be making a quiet book for my great niece as well as making new pages for my preschooler’s quiet book, and your patterns and ideas are a huge blessing. Thank you! I started with the hinge piece sewn sticking out of the left side of the door. I positioned the door over the opening and trimmed the hinge so it would fit in the pocket. I tucked the hinge inside the sewed a vertical line of stitched through all the layers to hold it in place. The stitches are very close to the edge of the door opening, as you can see in the photos. One side of the snap is on the rounded latch part of the door, the other side is sewn to the dryer front, just to the right of the hole. These patterns are wonderful. You are so creative and generous! I started making my daughter a quiet book using mostly your patterns. They are so easy to follow along with your photos and blog posts and so far they have each turned out beautifully! I love this one in particular. I had so much fun designing the socks. I even made an argyle pair! Thanks again for the patterns and the inspiration!! This is so cute! I am almost done making the page, but I’m having trouble with the magnets. The first kind I got (just a magnet strip) did not stick at all with the felt between them. I’m looking at the super-powerful neodymium magnets, but they seem to break so easily, I’m worried about giving them to a little child even in the felt. Do you remember which kind of magnets you used? Thank you so much for sharing your patterns and your clever and creative ideas with everyone. I LOVE every page you’ve done. Keep it up!! What kinds of magnets do you use for these? I looked at my local craft stores today and only found big round ones. I created my own version of the sock matching page and linked back here! I love your work! I’m just getting started at making quiet books for my granddaughters. I tried to print the pattern for the sock matching with clothes dryer and only the first page had the pattern on it. The second page was blank. Would you please fix it so I can print the entire pattern? Thanks! I am in love with your quiet book pages. So generous of you to share your talent, patterns and give directions on top of that. Planning my first attempt at a quiet book for my daughter and will be heavily utilizing your page. Thank you! I have decided to make a quiet book for my first grandson. I am starting with the matching socks page. It is the one that inspired me to do the whole book. Thank you for the instructions. I love your creativity! I have all of the pieces cut out and can’t seem to find any magnets that go through both pieces of the felt! What kind of magnets did you use for this page? Just saw your previous comment about them! Sorry! lol I love your pages by the way! They are so cute! Hi there! Love this page! Hi, I am such a fan of your pages, thank you for sharing your templates. 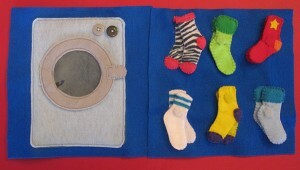 I would like to make this laundry page but am not sure how to assemble it. Are there directions that I missed on how to assemble the parts? Thanks a million! There are basic instructions in the body of the post. Please let me know if you have specific questions! 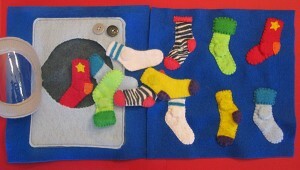 Quick question: Do the socks stick together when they are in the dryer, since magnets attract magnets? Do you think its possible to use just pieces of metal in the loose socks and have the magnets just in the appliques? I haven’t made a magnetic page yet, and am wondering if the magnet would be strong enough through the felt to attract metal rather than another magnet. I hadn’t really noticed the socks sticking together in the dryer, but I’d think they might. 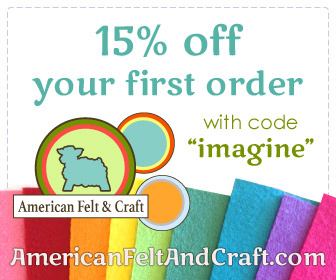 Craft magnets come in varying strengths – you’d need to experiment with them and different metals, as well as your felt thickness. Thank you for the ‘socks’ QB page. Love your pages. Thank you for the great idea and pattern – here is my version of it!! 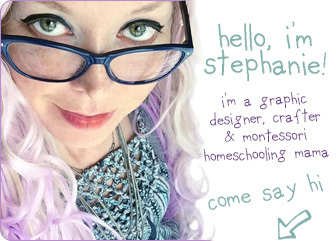 Stephanie….your ideas are adorable & how generous of you to share! Thank you!! I’ve been gathering ideas & materials to make my 2 year old granddaughter’s book. I happened upon a pack of baby socks at Dollar General….7 for $5.50. What sealed the deal to buy them was they had the days of the week with adorable colors & designs….many learning aspects to be had from 1 idea….matching, learning the days of the week in order & eventually reading them. Sure seemed worth the $. I’m excited to get started. I love your quiet book ideas!! Thank you for sharing your templates! I am starting my sock page and was wondering what is the ring you were referring to for keeping the magnets in place? Thanks a bunch!! Hi love your socks. Do you hand see all of it? This is a super cute page, but I had trouble following it through. 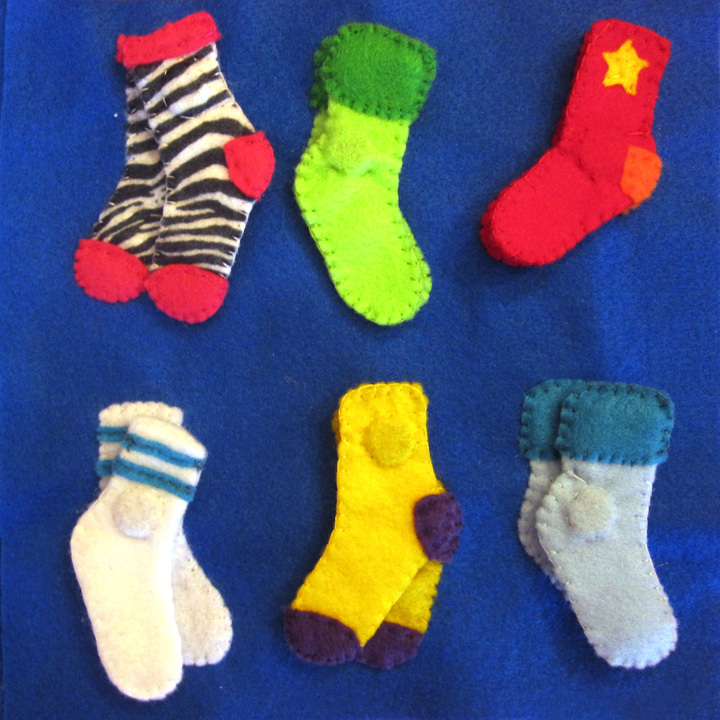 I had trouble with the magnets, I tried the strip kind and they were not strong enough, then got the 1/2 inch circles and after sewing them into several socks, found that they weren’t strong enough to stick together. After much stitch ripping, I finally used snaps on the socks. Then I had trouble with the dryer door. I cut out the patter for the clear plastic and had an awful time getting the 2 gray circles, 2 hinges and door clasp and the clear plastic all pinned together, the plastic kept slipping out into the middle of the circle. I finally used a larger piece of plastic, pinned and sewed it all together, then trimmed the plastic around the outside. I finally got it done, but was frustrated with this project. Maybe these tips can help someone else with the same problems. Hi Stephenie! Thank you for sharing great ideas and all these patterns which hide a big big big effort of yours. I have a question about thickness of your felts. I’m from Turkey and we have different felt types, all their thicknesses are different like 1-2-3-4 mm. Which one I should prefer? For background or for socks or for door? Really great idea, but I really can’t recommend using magnets for small children. If they swallow them (or their younger siblings do) this can be seriously unsafe. Better to use Velcro or snaps. or just let the child place them on top.